South/South, founded in 2009 in Rio de Janeiro, has resided here as an open laboratory and a space to think. In 2012 it transplanted to The New Inquiry. For about a year I double-posted both here and over there, but that has since winded down. All 2009-2012 posts will stay put here as open archives. No-charge, first-run feature films screened on 35mm for Guantanamo Bay U.S. Naval Base prison guards, troops, and their families (not detainees) by the Movie Program at GTMO (‘A phenomenal place to be, [where] one can enjoy great snacks from the concession stand during the movie. With GTMO’s exceptionally beautiful year round weather, movies are very rarely postponed’). over the world’), Side Effects (‘a psychiatric-meds melodrama about an NYC woman whose husband’s in prison’), and Warm Bodies (a zombie love story ‘with much of the world’s population now an undead horde’). As documented by Miami Herald journalist Carol Rosenberg. Bayt Mahsir, 1932, photographed by Ukrainian immigrant Haim Berger (YNet). Beit Meir, photographed by Daniel Ventura (Wikimedia Commons). 8-9 May. 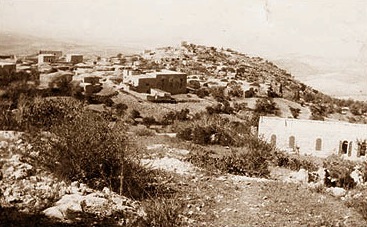 As part of Operation Maccabi (launched by the Haganah) the Harel Brigade sets out to attack and conquer the village of Beit Mahsir. 10 May. The village of Beit Mahsir is occupied. —Meron Benvenisti, Sacred Landscape: The Buried History of the Holy Land Since 1948 (trans. Maxine Kaufman-Lacusta, UC Press, 2000) 4. The two books about the village of Bayt Mahsir are from refugees living in Jordan; one was written in calligraphic longhand and published in al-Baq’a refugee camp in 1988, the second was published in 2002. These books inform me that the villages have been largely destroyed, and replaced by two Israeli towns: Bayt Mahsir is now named Beit Meir and is a religious moshav (cooperative farm), and Suba has become Kibbutz Tzova. I locate contemporary maps of the areas west of Jerusalem and discover that Kibbutz Tzova/Suba and Beit Meir/Bayt Mahsir are located in the Martyrs’ Forest (Ya’ar HaKdoshim). Established by the Jewish National Fund (JNF) in 1951, the Martyrs’ Forest commemorates the six million European Jews who died in the Holocaust. The JNF map of the Martyrs’ Forest shows the commemorative locations, along with picnic areas, biking paths, archaeological sites, and the Israeli towns that have been built there. The geography is such that without knowledge of the Palestinian villages’ existence in the past it would be impossible to know that they were once here. —Rochelle A. Davis, Palestinian Village Histories: Geographies of the Displaced (Stanford University Press, 2011) 1-2. Several village houses have been spared, and are for the most part interspersed among the houses of the settlement of Beyt Me’ir. Two large, rectangular-shaped, almost identical houses built of limestone rise above the Israeli settlement’s cabin-like residences. The remains of a flourmill, a metal machine with flywheels fitted over a stone structure, can still be seen. There is a wild forest of old trees on the eastern edge of the village site, on top of the mountain. The tomb of al-’Ajami, together with other graves, are among the trees. This first appeared at The New Inquiry. If cinema is part of the industry of masks, then what industry does cosmetics (‘the industry of masks’) belong to? Etymology is not a zero-sum game but I am struck by the the alignment of cosmetics (from French cosmétique, derived from Greek kosmētikos, from kosmein ‘arrange or adorn’) and order. The friendliness between cosmetics (from kosmos, ‘order or adornment’) and aesthetics (from aisthēta ‘perceptible things’) only serves to embolden the corollated relationship to sensible distribution and arrangement. There is another regime endowed with the power of ordering space and perceptible things (and also their synthesis, the spatial arrangement in which things appear). As I’ve written in the wake of Rancière’s work, that is the police regime. The police regime is a useful and generative category¹ and it goes without saying that it doesn’t always, though often does, require imagining actual uniformed cops. My larger point is that to read cosmetics as a police regime doesn’t necessarily require a poetic license, so in this regard I think I am coming out as a fundamentalist with regard to perception and space. The U.S. Food and Drug Administration defines cosmetics as ‘articles intended to be applied to the human body for cleansing, beautifying, promoting attractiveness, or altering the appearance without affecting the body’s structure or functions‘ (emphasis added). Couldn’t the operation of altering appearance without affecting structure and function be a foundational and concrete thesis on police? Sometimes cosmetics and police regimes align literally. In Saudi Arabia the Committee for the Promotion of Virtue and the Prevention of Vice tried to force a woman out of the mall after they spotted her wearing nail polish.² The difference between this particular harassment by the volunteer vice squad and hundreds of others like it is because ‘Manicure Girl’ filmed the exchange and posted the video online; the CPVPV later filed a formal complaint against her for doing so. All charges against the passenger for using ‘abusive profane language’ were eventually dismissed by the prosecutor, but not before Ms. Daniels was placed in a holding cell and detained for 10 hours. The incident developed after the passenger was told by a flight attendant to stop painting her nails because the odor of her nail polish remover was bothering other passengers. Ms. Daniels complied, but later completed finishing her nails in an aircraft bathroom, believing that doing so in the privacy of the toilet would be less offensive to others. Both the Riyadh and Las Vegas accounts ended with retaliation not for the nail varnish in question but the reaction of its wearers: the online posting of the video in the former and the ‘Stop bitching at me!’ remark in the latter. Policing regimes demand smoothness and unwrinkled surfaces instead of striae, ridges, or disruptions. ¹ ‘Useful and generative’ because this reading atypically displaces the policing regime from the user of cosmetics herself. ² On a personal note I have yet to be interpellated by the cosmetics vice squads in Iran, though my nail beds were heavily surveilled in Catholic school. ³ Anyone impatiently waiting to utilize the phrase ‘the Saudi Arabia of ______’ would be ingratiated by this straight-from-the-papers comparison between the Kingdom and U.S. flight proceedings, so go right ahead. The physiognomy of the human face confers particularity and evidence of a singular self. In many societies the face reflects a gateway to interiority and humanity (suggesting so seems like stating the most obvious and commonsensical human notion, like air, water, or universal grammar). Even the elementary boundaries of the English language afford a grasp on how integral one’s face is to persona (putting one’s face on), character or reputation (saving face), conflict (wearing a game face), social exchange (talking face to face), or inhumanity (faceless bureaucrats). As such, it is difficult to imagine how the sight of the covered face wouldn’t trigger suspicion in ‘Western’ societies. Yet the unavoidability of surveillance, microsurveillance, and dataveillance (and some cooperation from our part in them) is also a major source of anxiety. The quantifiable, qualifiable, and codifiable economies of the face that concern me, and form the basis of an ongoing research project, spring from this paradox. These are some images culled from that project and shared here as an open text. I have coated each image in a similar tint so individual colors would appear less distracting and more seamless. The title refers to the simulacra effect of covered faces: because the obscured or masked face resists representation, it can only be repeated, a phenomenon that grants it what Jacques Derrida called a “terrible power.” The significance of that terrible power is what I will to continue to examine. First published on the Art Dubai blog, 6 March 2013. For a generation of young activists, the reality of war, imperialism, racism and the growing fragility of democratic liberalism was too much to handle. Force became a means to wrestle with this tension. As the discourse of a “country torn” finds its way into mainstream political analyses (for many the deep divisions in this country are not a new political reality), we should reflect on the writings of political dissidents and radicals. We should recognize the diversity of political analysis that is very much alive. The histories of armed struggle, if taken seriously, provide us with a means to think more critically about the center, and complicate its claims of moral and political right. Why doesn't the U.S. have a name?